There is one response that probably tops most lists of health goals; Weight Loss. Historically over the generations and still today, there is always room for a downward shift in the figure that appears on the weighing scales, whether it’s a priority or not. More recently, another health goal may well be a new contender for that top spot; Adopting a Vegan Diet. 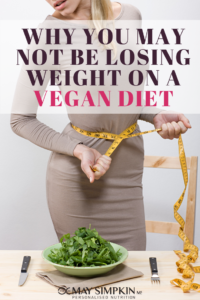 For those with both these health goals in mind, the two may seemingly go hand in hand; in other words, adopting a vegan diet will help you lose weight. Interestingly this is not merely a notion; an Oxford University study of 40,000 adults found that those who ate a diet high in meat, had the highest BMIs with Vegans the lowest and vegetarians in the middle. However, in reality, my clinical practice experience does not coincide with these research findings and in fact, those who have cut out all foods originating from animal products did not lose weight and worse still, gained weight! 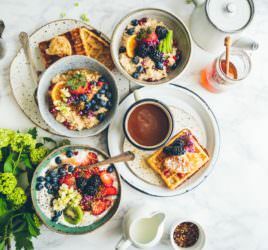 With the rise of image issues, where weight is a big factor, and the rise in popularity of a vegan diet, let’s take a look at some of the ways that might be sabotaging your good intentions and weight loss efforts. Protein is the one food group that is should be the focus of a new vegan diet with getting adequate protein the main aim. Adequate protein is also an essential as part of a weight loss programme. A study of men and women following a weight loss diet where one group ate the recommended daily amount (RDA) of protein or twice or three times the RDA, found that the latter groups lost the most of fat and therefore had the highest weight loss. However, unless you carefully consider your meals, planning and prepping, you may find that you’re not ensuring good quality proteins in the right quantities. There is no doubt it is harder to achieve this on a vegan diet but by no means impossible or even that hard, but you cannot rely on haphazard choices. Here’s how to ensure adequate protein…. Increasing your beans and pulses will go a long way to ensuring good protein. So when you’re shopping pick up one of each type; any colour, shape size and add the to a soup (homemade or shop-bought), sprinkle half a tin on a salad or add extra to a casserole. Quinoa is also a grain that is a complete protein, providing all the essential amino acids that must come from the diet. Eating quinoa in place of a carbohydrate such as pasta, bread or potatoes will increase the protein quantity of your meal. Nuts and seeds are also good sources and can be eaten as a nutritious snack or sprinkled on a salad for added texture. If you’re not managing a balanced diet at the outset of your new vegan diet, the a pea protein supplement powder in a smoothie can also boost your protein intake. Switching to a plant based diet inevitably focuses your choices on healthy wholegrains such as brown rice, wholemeal pasta and wholegrain breads as well as vegetables, fruits, nuts, seeds and the ubiquitous avocado. These choices are indeed healthy but there is a tendency to allow yourself unlimited quantities, because they are healthy. One very simple reason that you are not losing weight, or even gaining weight, is that your nutrient intake far exceeds your needs. After all, a breakfast bowl of oats, cooked in coconut milk and topped with fruits, nut butter, nuts and seeds, whilst delivering a nutrient rich start to the day, will not come with a low calorie tag. Considering your portions, using less ingredients per meal and even considering using smaller plates or bowls to limit the amount of food you eat. By switching to a vegan diet, you find yourself focusing on your food choices more than ever; after all, you need to ensure a good balanced diet despite eliminating a number of food groups. With food a focus of your day, you may find yourself grazing throughout the day. The thinking has now changed and based on the latest research, the idea of eating 3 meals a day plus 2 snacks is long gone and ideally snacks should be avoided with a weight loss goal in mind. Why is this? Insulin is released each time we eat a meal and its role is to remove the sugars that are released into the blood once a meal has been digested and processed. We only need sugars for energy, thus, uf there are too many sugars released into the blood and these exceed the energy requirement, ie. as a result of a diet that is high in sugars and carbohydrates, then the sugars will be removed and stored, as fat, mainly around the middle. Each time food is eaten, this cycle repeats itself and including 2 snacks during the day encourages this insulin release. If there is a higher energy requirement, then this higher intake of carbohydrates can be justified and the sugars released will be used for energy rather than stored. However, the likelihood is that energy requirement is limited if you are sitting at a desk, in the car or on the couch. Thus when insulin levels are high, it is more likely that the sugars will be stored as fat, resulting in weight gain. Here’s how to avoid the snacks…. Ensuring good protein and vegetables will ensure you stay fuller for longer and therefore avoid the need to snack. Prioritise the protein in your meal, whether that’s nuts, nut butter, nut milks, tofu, quinoa, lentils, beans and even vegetables, which have a surprisingly notable protein content. Following from the previous point, with food and snacks as a focus of your thoughts, manufacturers have risen to the occasion and provided some tempting plant-based alternatives for vegans. Great, but more often than not, these are little more than junk food disguised under the healthy vegan banner. Take vegetables chips for example; these are very high in oil and salt and any nutrients that vegetables started out with have long been eliminated during the cooking and processing trail. Coconut milk, delicious, creamy and sweet is laden with calories and highly processed, so less nutritive. Vegan ready meals will contain “filler” ingredients such as refined flour providing little nutrient value. Avoid processed foods in the speciality aisles and instead go back to real food, in other words, if you need a snack, choose fruits and nuts or high percent cocoa solids chocolate or perhaps some cruditees and a hummous or avocado dip. Some great words of wisdom. I often look at ‘clean eating’ recipes packed with energy dense foods and think, wow, that’s a lot of calories. Especially when people try to recreate something like millionaires shortbread with dates / almonds etc. It’s full of healthy food but still shouldn’t be eaten in large quantities! I am going to follow Nigella’s apparent weight loss solution. Yoga. Yep. I read that her recent weight loss is just down to yoga….I am not convinced. I’m sure Yoga will have a significant impact, but always worth remembering weight loss is down to 80% diet and 20% exercise! Obviously Yoga will have many other health benefits too, so definitely worth considering.